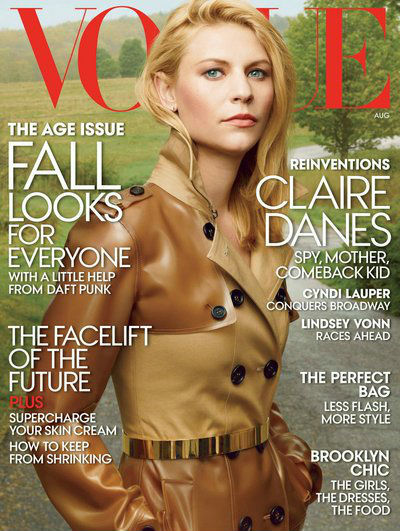 –Claire Danes not only looks amazing on the new cover of Vogue, she also uses the interview to call out a fellow actress who used to bully her as a teen. She also reveals that she spent the two years before Homeland struggling to land gigs. What kind of monster wouldn’t want to hire Angela Chase?! -Leave it to Mariah Carey to bedazzle her sling. -Everyone’s wondering how Glee is going to handle this. If the show has to continue, I don’t mind the idea of a flash-forward and an entire relocation to NYC. -After all the terrible, terrible news over the weekend, the royal baby just needs to hurry up and get here already. David Beckham is even offering to help William and Kate along with some solid naming advice. -No one seemed to Tweet nice things about The Newsroom‘s season premiere last night — except for the journalists who were paid to. -I can’t stop looking at the photos of celebrities at Jimmy Kimmel‘s weekend wedding. I just wish there was a front-on photo of Emily Blunt‘s adorable-from-the-back pink and yellow dress. Also, I’m loving that Kristen Bell still looks like someone who just gave birth and not like one of those alien actresses who immediately slim down to their pre-baby bod. -Oh, and it appears that Gabby Sidibe arrived in a wedding dress. Part of some Kimmel-approved prank, perhaps? -This is awesome: a couple who were driving to a Dave Matthews concert stopped to pick up a hitch-hiker…who turned out to be Dave Matthews. -It was a big publicity-garnering weekend for Jenny McCarthy. Not only did she land a new boyfriend, but she also landed a cohost spot on The View. –Carly Rae Jepsen throws like me. Which is to say, terribly. -Is it possible that Justin Timberlake (or anyone on his team) really had never heard the phrase “Take Back the Night” before? Really? –Arrow’s Stephen Amell posted a photo of himself from hiatus that seemed to suggest he’d gotten chubby. I don’t see it. –Benedict Cumberbatch is wearing jorts (or are these japris?). Either way, it’s amazing. -This is a long (loooonnnnggg) article on Jay-Z’s business acumen, but definitely worth a read. He’s giving 50 Cent a run for his money when it comes to, well, money. -Meanwhile, Beyonce posted an adorable new holiday photo with Blue Ivy. –Courteney Cox‘s face has looked jacked for a while, but this is crazy. -I’m not sure why Demi Lovato spent a day working for Buzzfeed, but she did. Here’s the fruits of her labour. -Someone may have been creeping on Kim Kardashian‘s medical records. Cedars-Sinai has fired six staff members for privacy breaches. -I had no idea that Louis CK was in the new Woody Allen movie. And this clip makes it look like an extended episode of Louis. Awesome! -I don’t watch Big Brother, but seriously, why are those people allowed on TV? These clips make them seem like terrible, terrible people. -Not only are we getting a Veronica Mars movie, we’re also getting two new books, which will pick up where the film leaves off. -The latest trailer for Jobs just debuted on Instagram which is, um, new. -Speaking of trailers, the first one for Christian Bale‘s Out of the Furnace looks intense!